Boy, it's been a long time since I've reviewed a D-Link router! But when I saw that the company had released a combination N wireless / HomePlug AV product, I had to take a look. 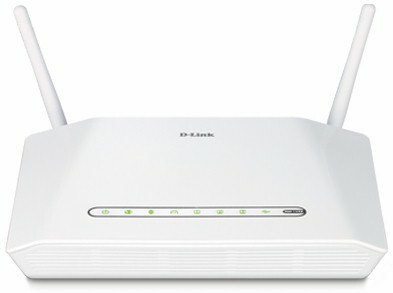 The DHP-1320 doesn't look like D-Link's typical router. Its all-white plastic case indicates an attempt to make it spouse friendly so that it doesn't get tucked away into an equipment cabinet. D-Link hasn't gone as far as Cisco's new Linksys E-series designs, however, and still has blinky lights on the front panel as shown in the front panel callout shot below. They even include screw-head mounting slots on the bottom cover in case you want to wall or ceiling mount it. D-Link also still believes in external and, yea, even upgradeable antennas, with dual dipoles that attach via RP-SMA connectors. All the ports are 10/100 and since the internal HomePlug AV adapter takes up one Ethernet port, you get only three switched LAN ports. That USB 2.0 connector supports D-Link's un-user-friendly SharePort printer and storage sharing feature and WCN Configuration, in case for some odd reason you would still want to use that. Note the handy power switch and AP / Router mode switch. But if you want to shut off wireless completely, you'll need to do that from the admin interface. The inside shot from the FCC ID docs shows most of the circuitry covered by an RF shield. The components on the right are the internal power supply and part of the HomePlug AV circuitry. With the RF can removed, we see that it's an Atheros-based design, which is no surprise, given Atheros' push to popularize its "Hy-Fi" combination wireless / powerline product portfolio. The main CPU is an Atheros AR7241, which is pretty hard to find information on. It appears to be a router SoC with built-in four-port 10/100 switch and an extra 10/100 port for WAN use. The 2.4 GHz radio is an Atheros AR9287 2 X 2 single-chipper. I could make out 32 MB of RAM, but could not tell how much flash there is. It's probably 4 or 8 MB. The 200 Mbps HomePlug AV powerline portion uses Atheros' INT6400 / INT1400 third generation HomePlug AV chipset. The DHP-1320 doesn't stray far from the standard D-Link routing interface or capabilities. Here's a quick rundown of the features. You can also test drive it in AP and router mode using the on-line emulator. Automatic uplink (LAN to WAN) only QoS with manual / automatic uplink speed detection. I'll also note that there is an annoying 15 second saves required for each page when you make admin setting changes. This can get old fast. I also wish that there was a short cut for adding and especially editing Access policies (outbound port filters). I appreciate the wizard's help, but not every time!